If there was a defining recipe of my childhood, the above cake would be second only to microwaved Marmite and cheese sandwiches. Which is where you take many bread slices, butter them, spread them with Marmite, pull several slices of cheese from the block with the wire cutter, layer them all up in a stack on a plate (probably plastic and not microwave safe) and then nuke until the cheese is bubbling violently. Allow to cool slightly, then eat. Alternatives include tomato sauce and cheese (like a low-rent Margherita pizza…kind of) and, uh, golden syrup and butter. In fairness, this was in the days where I was dancing in every spare minute, and there wasn’t a lot of time or access to fancy snack foods. It’s no wonder I gravitated instinctively towards the improvisational and energy-dense. Plus I love melted cheese. What I baked the most in my childhood though, for family members’ birthdays, for Calf Club (a kind of elaborate rural pet day, FYI) competitions and simply for my own entertainment, was this cake recipe which came with a glass bowl Mum bought in the 80s – one of those round, slightly opaque baking dishes with high, ridged sides. I suspect it became my go-to cake because it was very simple and didn’t involve any expensive ingredients and therefore wouldn’t be too stressful to my parents that I was making it so often. 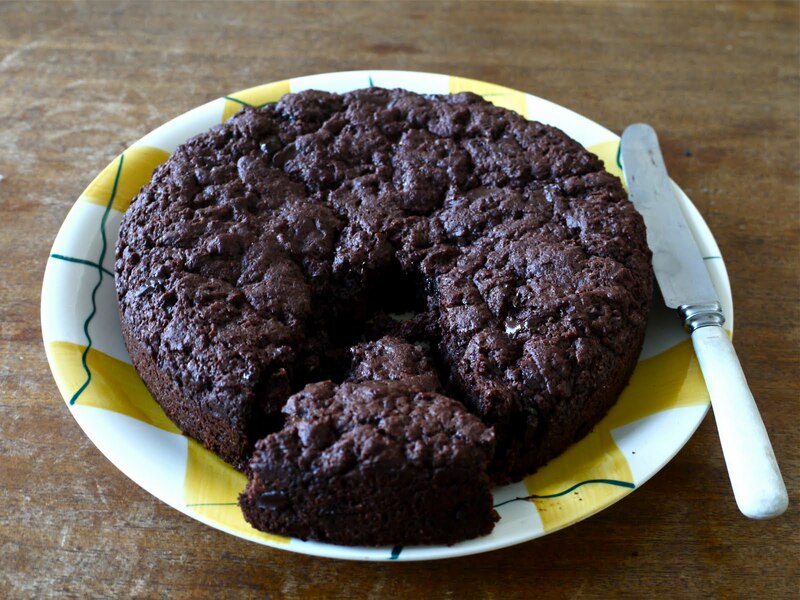 I didn’t realise it at the time when I was a kid, but it’s completely vegan – using water, vinegar, baking soda and oil in place of the richness and raising abilities in butter and eggs. These ingredients mean that it’s a fairly spartan-tasting cake, which I also didn’t really realise at the time, since I didn’t have much to compare it to. In hindsight, I feel a bit sorry for everyone in my family who had to choke down slices of it every time I insisted on baking it, but at least I was always generous with the icing. After all this you might wonder why I even emailed Mum for the recipe. Partly curiosity about how whether I’d still like it, and partly in recollection of its dairy-free-ness, which makes it pretty attractive to me right now in these times of brutally expensive butter. Mum did say “wouldn’t you rather just turn off the heater and eat butter instead?” to which I respond…I’m sorry…that I want to have my cake and eat it too. I have made a few additions to the recipe though, so that you’re not stuck consuming the same firm, pale brown disc of cake I grew up on. The title needs work, but at least the recipe doesn’t anymore. 3 tablespoons cocoa, good dark stuff like Equagold if you can get it. Optional but excellent: 100g very dark chocolate (I use Whittakers) roughly chopped. Set your oven to 180 C/350 F, and line a 20cm tin with baking paper. Using the back of a spoon, make a well in the centre (like, a bit of a hollow/valley in the flour-cocoa mixture that you can pour liquid into. I used to spend ages on this bit, smoothing the mixture into precarious sand-dunes. Mind you I used to think those hideous framed sand-oil-water things were really cool) and pour in the oil, salt, vinegar, and fruit juice. 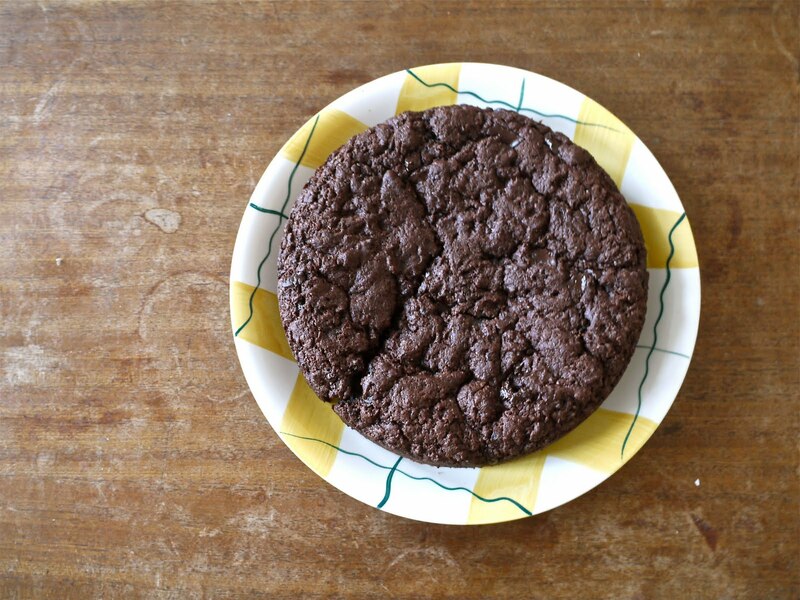 Using a spatula, stir everything together thoroughly, transfer to the prepared tin, and bake for around 40 minutes. Once cool you can ice, or it’s just as fine plain. Mum concedes that it wasn’t the nicest cake but it was good for kids because they just want to eat the icing anyway, and it was very easy to put together, so “it never felt like a waste of time baking it.” In case you’re wondering where the changes were made, I upped the cocoa, and added brown sugar and chopped chocolate. These helped make it a little darker and richer. Then, I changed the liquid content from plain water to juice – the reason I say you can use any juice is that the flavour itself doesn’t seem to be overly strident once the cake is cooked, instead adding an overall extra layer of sweetness and distracting from the slightly fizzy vinegar aftertaste which could sometimes otherwise linger. In short, and the reason you might want to make it at all, it’s a really delicious cake now, instead of being a cake that was okay for kids in the early 90s who didn’t know any better and who were mostly interested in the icing on top anyway. 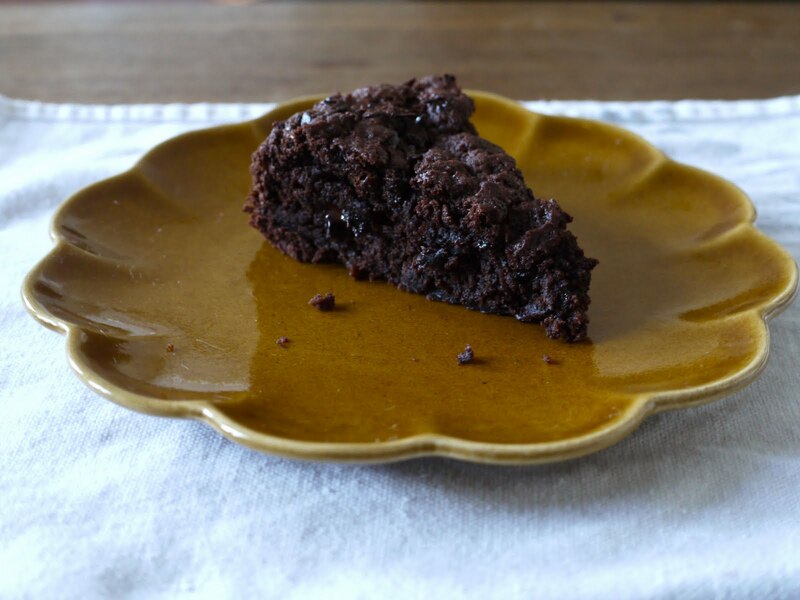 It has an unambiguous chocolate flavour with a pleasingly un-dry texture – almost bordering on brownie-like with the brown sugar and lumps of dark chocolate. It’s really good. So good I made it twice this week, and tested it out on friends of ours on Friday night. So I can now tell you it also goes well with red wine. Title via: Ella Fitzgerald. Unfortunately there doesn’t seem to be any footage of her singing How Long Has This Been Going On but a voice like hers can stand tall in audio form alone. I was listening to some Be Your Own Pet for the first time in about three years, (I think?) I’ve never met one other person that thought their music was good, but their songs still capture my ears after all this time. Fire Department, for one. Paul Robeson, Going Home, from his Carnegie Hall concert in 1958. I don’t know why it is, but all his stuff on vinyl is always in the “we’ll pay you to take this” bin at record shops. Which works out nicely for me. Next time: Kate and Jason were talking about Nigella Lawson’s recipe for snickerdoodles today from How To Be A Domestic Goddess, and I realised I’ve only made them once, and that was in 2006, and that they were so good and I can’t believe I’ve never revisited them. That time might be now. But on the other hand, I recently won a copy of the lovely Flip Grater’s cookbook and it’s full of recipes that I want to try repeatedly. So, it’ll likely be one of those options. hahaha 'sand-oil-water things' – I SO know what you mean! I got a recipe very similar to yours from a friend at work. It's become my go to cake. And everyone's usually amazed that it's vegan. I'll definitely try this one out! I would always make a microwaved tortilla sandwich with cheese, cream cheese and ham. Lots of cheese bubblin' action there, too. Lots of good. Drat that I no longer have a microwave. 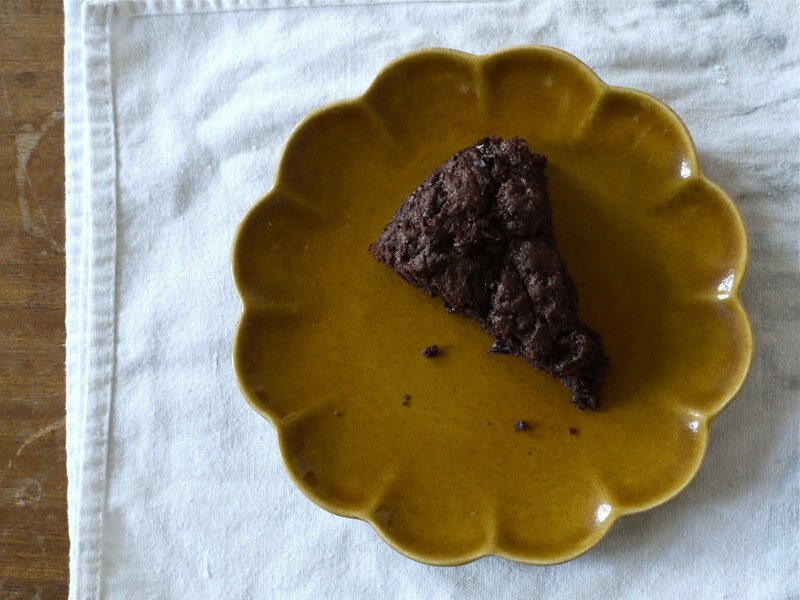 I've made a cake similar to this before; it came from a book of old-timey recipes. I think the recipe was from the World War II era when butter was sky high expensive or not even around. It tasted great to me though! This recipe is just like one my mother used to bake in the big square roasting dish — yes, the same one she used for the roast meat! It must have been doing the rounds of NZ kitchens for quite some time. Thanks for giving it a revival. Hmmm – I will use butter and put on an extra cardigan! I've made this variation a couple of times now, and served it with raspberries or raspberry jam and cream. It has gone down a treat with friends, who've even asked for the recipe. Haha how cool is that, you were a trendy vegan cake eater without even realising it! Cool as. Super enjoyed brunch with ya'll, I want more of those mushrooms again already!